While renovations can increase the value of your home and get you the beautiful look that you’ve always wanted, renovations can sometimes also be stressful, especially when you have a young family. 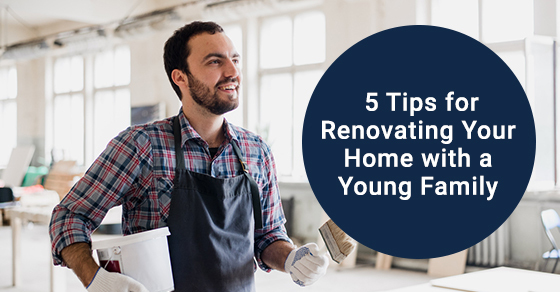 Take a look at these handy tips to make your next renovation with your young family as smooth as possible. Hire a local builder that you find credible and trustworthy. They should be reliable as well, and if they don’t offer an insurance-backed guarantee then you should avoid them at all costs. Having a young family to take care of is hard enough. Enjoy peace of mind by hiring a local builder that you can trust to do a good job, and who provides an insurance-backed guarantee on their work. Once a trustworthy builder has been hired, it’s easy to get excited about what’s to come: a project that will increase the value of your property, and provide you with the beautiful home additions that you’ve always imagined. But it’s important to remember that there can sometimes be unexpected bumps on the road to your final goal. That’s why we recommend creating a flexible plan ahead of time to prevent any possible issues once the work begins. Remember that rates may change, and timelines may be extended, so flexibility on your end will ensure that nothing catches you off guard. During the renovation process, you may discover that additional work needs to be performed due to unforeseen issues. As such, you should prepare for the possibility that renovations may take longer than intended. That is, be generous in your estimates of how long renovation work will take. If you are renting another location while the renovations are taking place at your primary residence, then you don’t want to worry about being left with nowhere to go if you can’t move in when scheduled to. Often you can stay in your home because only a few renovations are being performed. If this is the case, then clear boundaries should be established. For instance, a room should be set aside for your children to play in. By doing so, they will not inconvenience your workers, and they will also be kept safe throughout the renovations. Moreover, most contractors are very accommodating and will work around your schedule, to ensure that you will not feel inconvenienced while they work towards helping you achieve your home renovation goals. Renovations can quickly bore children, so why not plan several outdoor activities to keep them busy and engaged? Getting your kids active and outdoors will distract them from the fact that certain parts of your house are out of commission. If the weather is warm, consider planning a day trip to a local park, or try going to an outdoor splash pad or pool. If your renovations are happening in the midst of the winter months, take your kids sledding. There are also many light shows and outdoor excursions around the holidays to keep the family busy. While a renovation might require a bit of compromising when it comes to your everyday routine, there are definitely ways to work around it and keep your entire family content while they await their new kitchen or bathroom. A family mood board will summarize all of the expectations and hopes that your family has for your renovations. By doing so, each member of your family will have something positive to focus on. This means that when renovations begin to take place you can help create some excitement over the end result as the anticipation continues to build. Renovations can sometimes take an extended amount of time to complete, which can sometimes be frustrating for children. When completely re-doing your kitchen or bathroom — which are both integral, family-centric rooms in your home — young children can sometimes get fed up with the wait. Having a mood board to show your family what the finished product will look like will help keep them excited about the new changes. For more tips for renovating a home with a young family, call Avonlea Renovations at 416-907-7891 or contact us here.